San Francisco Parks Alliance directs and collaborates on a spectrum of programs to foster citizen involvement in San Francisco open spaces and to help ensure our world-class city has the parks it deserves. 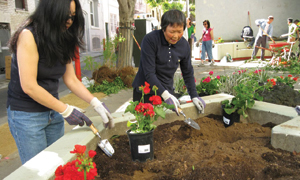 Whether it is mobilizing volunteer activities, fixing playgrounds, or greening unused public land, SFPA brings 55 years of experience with direct support to parks and open spaces. We make sure that the community's voice and needs are heard and informed by data-driven research and best practices, while at the same time leveraging the dedication of our most passionate park lovers. Active community participation in our parks fosters public investment in our city's open spaces. SFPA works with community groups and public agencies on a range of activities to steward parks and open spaces throughout the City. Each year, the Parks Alliance makes significant gifts to parks and open space through our Park Partners, Action Grants program and Party for the Parks. The Parks Alliance conducts advocacy around the community's park and open space needs, advised by our volunter Parks Policy Council and our staff analysis and research.